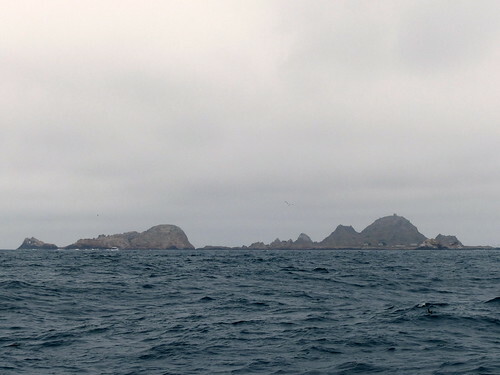 The Farallones. For years these rocky islands have drawn our interest, as they come and go in their mysterious way when you have a chance to look out to sea. 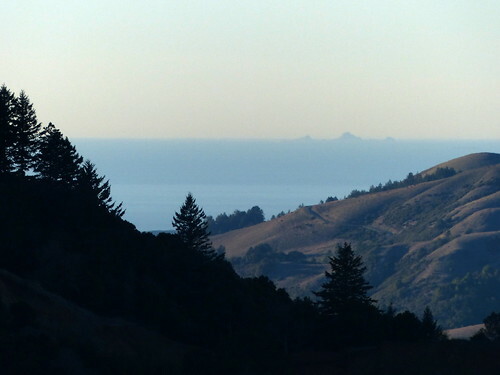 Here we see them from Russian Ridge, a good 50 miles away, on a reasonably clear day. They can appear much closer when viewed from the road winding down Mt. Tam to Stinson Beach, but in fact they are pretty far out there, about 30 miles from our point of departure, Pillar Point Harbor north of Half Moon Bay. Mellowcat and the Resident Expert arrived at the dock right on time at 6:30 am, and joined about 30 other people, our guide, three bird spotters, and the captain and deck hand aboard the Huli Cat, a 53-foot sport-fishing boat. 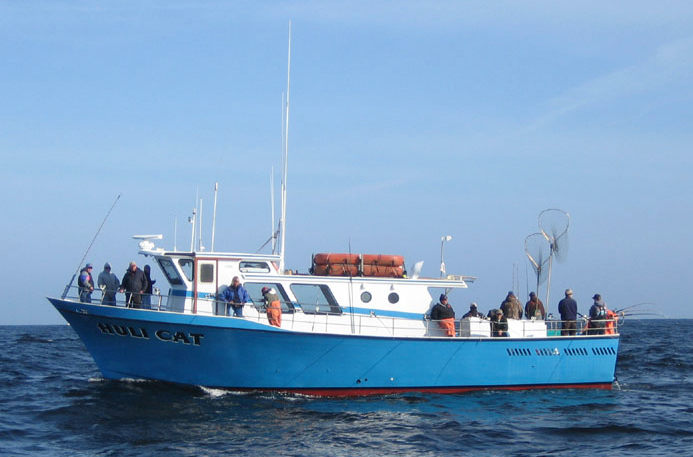 This picture shows the boat on a nice calm day with a small party of sport fishermen. We faced benign conditions, for this region of the Eastern Pacific. Swells less than 10 ft, overcast skies, and a steady headwind once we started making way. Our course took us out of the harbor, where we saw tons of Brown Pelican, and some cool new birds like the Black Turnstone and Surfbird. Those were identified for us by one of the spotters, Logan, who at age 17 is attempting a California Big Year (currently he’s at 417). Heading out of Half Moon Bay, the boat crossed paths with several hundred Sooty Shearwater, who were skimming the waves in their wing-dipping way like we weren’t even there. Then we started seeing Common Murre and Pigeon Guillemot. We hike the coastal trail south of Half Moon Bay frequently, but except for the Pelican we’d likely never see these other birds up close. That’s the draw of a pelagic bird trip; you get to see birds that spend most of their lives out on the ocean. 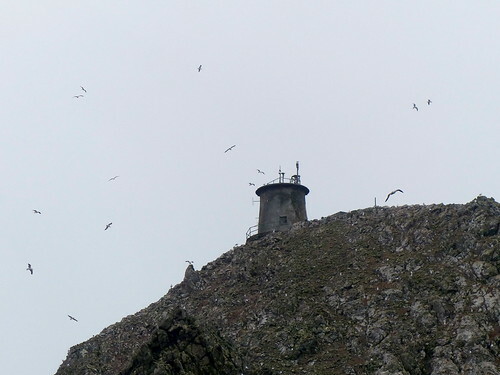 And our objective, the Farallon Islands, are home to a quarter of a million birds, so I figured on adding one or two new names to the List. Our boat plowed its way up and down the swells, and when we’d stop to check out a bird or sea creature, it bobbed around like a piece of driftwood. It was said in advance that we might not make it to the islands dependent on conditions, and I could see how a 15 ft. swell or high winds could make this trip rather dicey. A couple of hours into the trip we crossed from San Mateo County to San Francisco County, and the ride gets a little more rollicking. Some of the passengers began to experience “mal de mer”, including our very own Resident Expert. She’s battled that before, and Good Sport that she is, she got herself into a good place to ride it out. After about 3 hours we arrived at the islands. Called “The Devil’s Teeth”, apparently because we shared the same orthodontist. The captain made for Fisherman Bay, where the water was calmer and the birds were plentiful. The island is nesting ground for about a dozen different sea birds. The Western Gull dominates, and can be see here wheeling about the ruins of the Farallon Island Light. 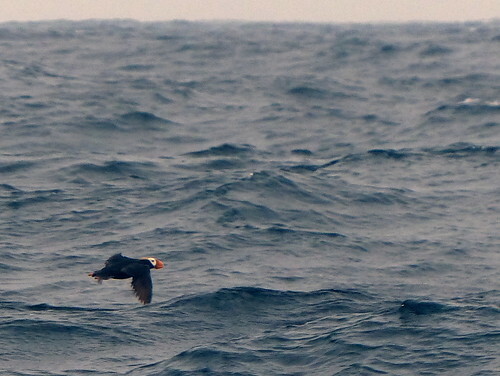 The island draws rarities as well, and the presence of two unexpected birds generated a lot of excitement on the boat. For me, almost all of these birds were new. We drifted in relative calm around the east side of the island, looking at birds and mammals. There used to be enormous numbers of fur seal here, at one time extirpated by hunters, and now they’re making a comeback. 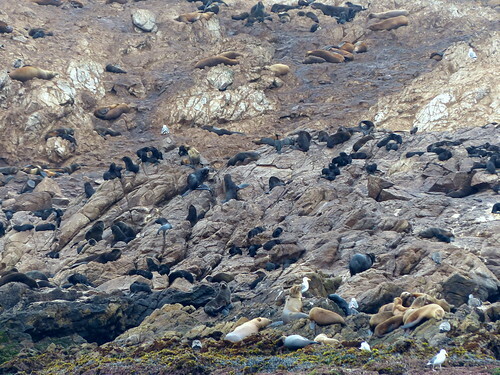 Here you see some, along with California Sea Lion and Harbor Seal, lounging on the rocks. 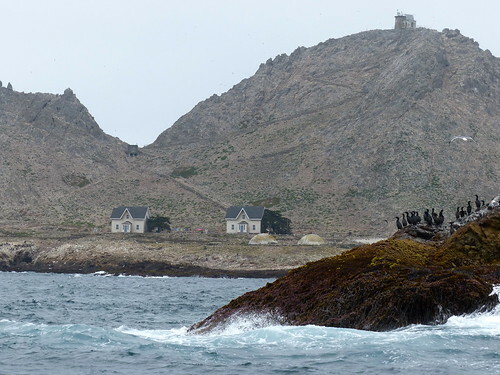 Moving on, we saw the Farallon Research Station. They say the researchers have to wear hard hats to guard against dive-bombing Western Gulls. The Islands are close to the Continental Shelf, and that was our next destination. The boat plowed through the swells, now accompanied by a salty spray driven by the unencumbered open ocean breeze. Those not feeling so hot now felt even less so. But the captain’s gambit paid off, as we found a few Humpback Whales out in the deep water. Resident Expert was still lying low, but looked out just in time to see the giant whale’s tail break the surface and dive below. She seemed to have a knack for this, looking up again just in time to see a Tufted Puffin floating by. This bird was one that many hoped to see. It nests on the island, but is not otherwise common in Northern California. Here’s one in flight. On the way back, the boat attracted a large number of Black-footed Albatross. Our guide had seen a rare Salvin’s Albatross out here just last weekend, and was hoping it might make a repeat appearance. The previous week’s sighting was possibly the first ever for California. Didn’t see it though. But for me, the regular Albatross was new and interesting. Like some other birds that spend all their time at sea, they can drink salt water and process out the sodium and chloride. We should ask them how they do that. 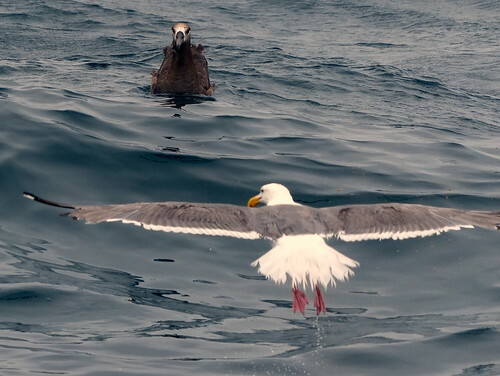 Here’s a Western Gull confronting an Albatross. The ride back was much more pleasant. The skipper was basically surfing the boat back in, rather than fighting the swell as we had to do on the way out. Resident Expert was back in fine fettle, and our adventure drew to a close. Would I go out again? Sure, but we’re going to need a bigger boat. I’m thinking something like a car ferry would do. For now, I think I’ll stick with the land birds. This evening I was out on the deck with Cat, watching a twenty minute mind war between a Common Raven and Mourning Dove. Tough to beat that for entertainment.